There are a few things we've purchased along the way that seem invaluable to me. There have been times we've splurged and purchased some of the more traditional school room type of supplies. A few times those supplies were only used a time or two and then forgotten but other times they have become homeschooling staples. Some of the things were purchased along the way as holiday or birthday gifts for the boys. Some of the things were items we saved up to buy, but many of the items were fairly cheap. We were able to purchase them with the money we saved not buying backpacks, school clothes, lunch boxes, etc. that the boys needed when they were attending school. We've even bought (or have been given!) 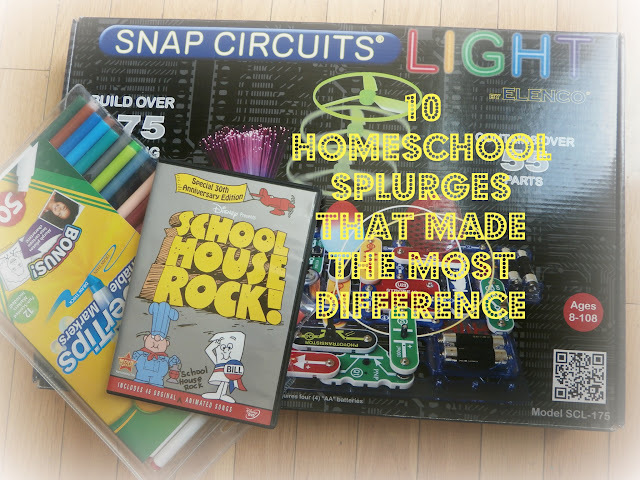 supplies from other homeschoolers who kids have outgrown or lost interest in supplies. Wall maps; we bought two large maps- one of the United States and one of the World. We reference these endlessly and I couldn't imagine trying to homeschool without them. We found our maps pretty cheaply on Amazon. But I would imagine access to maps of any kind whether they be in book form, a globe, or even a picture printed off the computer would work just fine. Microscope; I researched long and hard before shelling out money for a microscope. We had a few cheaper plastic ones that family members had bought for the kids through the years but we didn't have one that worked really well. We wanted a heavy duty, school room, scientific microscope and we just LOVE ours! We bought some slides to go along with it and are ordering some blank slides too. Laser Printer/ copier; I didn't think I printed out a lot of things with homeschooling but I found that I was replacing the ink in our ink jet printer every few weeks and it was more money for the replacement cartridges than the actual printer. I was frustrated and annoyed and so we turned to a laser printer. We've had it for 6 months and I've yet to replace any ink! I just wish I splurged a little bit more and bought one that printed and copied in color too. Mostly I'm just happy not to be buying ink all the time. Workbooks; we don't use many but I have found that, for us, math workbooks are great. They each pick one a year (or a series of mini workbooks) and we try to work through most of the pages by the time the year ends. They're always free to pick and chose which pages they want to work on but I honestly am not sure if we would have covered math quite so well without any workbooks. Though I do recommend Khan Academy for those unable or unwilling to buy workbooks. It's a pretty comprehensive and free computer sight that covers the whole gamut of math for grades k thru college! Memberships; we've bought family memberships to zoos, aquariums, science centers, etc. For the past three years we've tried to buy one or two memberships a year. We change up where we buy memberships to and we have visited museums while on vacation using our reciprocal memberships. While they can be costly I look at them as field trip experiences and figure that since I don't buy any expensive curricula it's our version of that. Visiting the same place multiple times a year helps us take advantage of special members only programs and opportunities and ensures the boys really ingrain those topics. By the end of the year memberships usually end up saving us money too. We typically divide the membership cost by the cost of one trip and see how many times we need to visit to make it worth the cost; typically it's three times a year & for some places that's super easy to do. Games; we buy a lot of board games and have always played them. Even when I know they teach valuable skills I still tend to think of them as family fun & not as school supplies. However, there are several games I have bought specifically because we were homeschooling and there were topics I wanted to find a fun way to cover. Some of our favorites were Scrambled States of America, Ancient History Memory, BrainBox for kids- The World Card Game, Word Wave, Spill & Spell, & American Trivia Family Edition. Math Manipulatives; When we first started homeschooling all of my boys were elementary aged and I thought that there were some math manipulatives that were just a necessity to bring math to life and make it fun. We could have gotten away with handmade versions of many of these or using objects found around the house but something about shiny, new "toys" brings delight and interest. Over the course of the last three years we've purchased some that have been so much fun and that we've used so much I couldn't imagine having taught without them. Our favorites have been pattern blocks (with matching stickers), plastic Hundreds Board, Rainbow Fraction Tiles, & Mathlink Cubes. Movies; we use a lot of movies for learning. Most of the movies we use we are able to get through our library. Some of the movies were not available through our library or they only had portions of each set and we wanted to watch them in their entirety. I'll often watch prices on Amazon and only buy when they have exceptional deals. We were able to buy the entire series of Liberty's Kids for $5. Through the years we've also purchased The Magic School Bus Boxed set, Travel the World with Kids, & Schoolhouse Rock! Toys; there are so many toys out there and my kids were already blessed with so many by the time we started homeschooling that I never thought I'd feel the need to buy anymore. However, once we began homeschooling our outlook on everything shifted and changed. We suddenly looked more to toys that taught as well as entertained and we found some definite favorites that we couldn't imagine not having. Snap Circuits being one of those toys! We also love all sorts of building Lego & Lego Technic sets, Q-ba Marble maze blocks, Keva Blocks, Magna Tiles, & things that encourage the boys to construct, think, and push the limits. Computers/ Kindles/ Wi-Fi network; While we have never felt the need to buy each boy their own devices we did feel it was important for them to have daily access to technology. Like it or not they're growing up at a time when technology is still exploding and to not know their way around computers, apps, and hand held devices would be detrimental to them. Anytime we talk about cutting family finances we toy with the idea of getting rid of the internet and utilizing the library's computers instead but realistically I just don't think that would work. We use the computer all the time and primarily for on-line games, articles, and so much more. It would seriously hamper my ability to teach them and so it's something we continue to splurge on year after year.